Synopsis: Criminal Justice major Yagami Light because disillusioned when he learns just how ineffective the justice system really is. One day he finds a mysterious notebook titled “Death Note.” It’s mysterious inscription says that the notebook has the power to kill those whose names are written on the pages. Light doesn’t believe this at first, but when he tries this out on a known criminal who winds up dead, Light decides to take justice into his own hands. Disturbed by the rash of mysterious deaths plaguing not only Japan, but the world, police forces start to investigate the matter with the help of the mysterious wunderkind known simply as “L”. 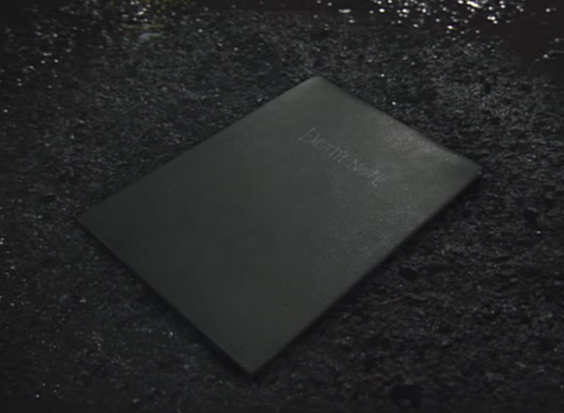 The movie opens with a mysterious notebook falling down to earth on a rainy night. Then we flash to a bunch of criminals who, after being exonerated or let go, die mysterious deaths. They die of heart attacks which is odd as all were in perfect health. Apparently these mysterious deaths are linked to a person who calls himself “Kira.” He has a website in which people discuss what he is doing (the majority all in favor of his vigilante justice) and which probably lists all the criminals he’s eliminated thus far. We then cut to a crowded street where a news report flashes on a big screen announcing the name and showing a picture of the gunman currently holding bank employees hostage. We then see a young man take out a notebook and write down the name of the criminal. A few moments later, the newscaster at the scene reports the gunman has died. Another victim of Kira. We then flash to Light playing a game of basketball while his girlfriend or at least love interest watches him. Akino Shiori is disappointed when she sees Light collecting money from winning the game and she scolds him. They then continue on to the cafeteria where they hear other students talking about the mysterious Kira. Light asks Shiori what she thinks and Shiori replies that she is against Kira’s vigilantism as the criminal justice system exists for a reason. Light then tells Shiori that he hacked the national police database and was horrified at learning about all the criminals who are never mete out justice. Kira performs a valuable service in getting those who go unpunished. Even with the flaws in the system, Shiori still believes in it and says that Light must as well as he is studying hard to go into law to become a police officer. 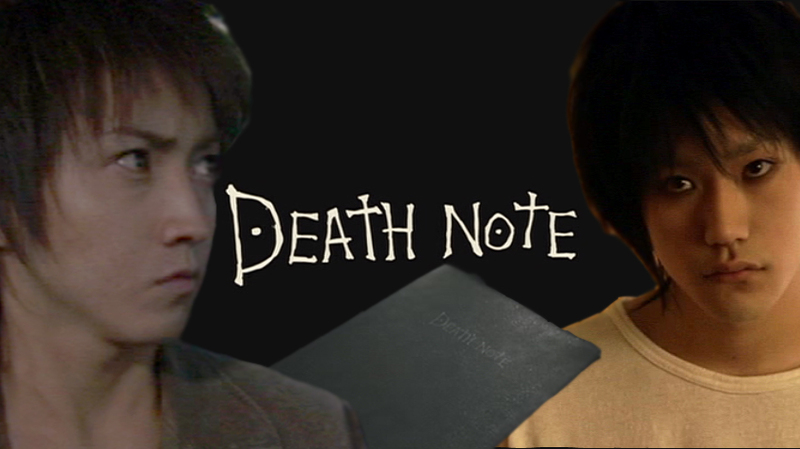 Light doesn’t tell Shiori the rest of the story about how after he tracked down one of the criminals who got off scott free, he finds a mysterious notebook with the phrase “Death Note” written on the cover. He didn’t believe the instructions at first and used it only as a joke. There was a news report and with the criminal’s face fresh in his mind, he writes down his name. The next day Light reads the newspaper and in it there is an article about the criminal’s sudden and mysterious death. So the notebook’s powers were real! As another test, Light trails the same murderer he did before. 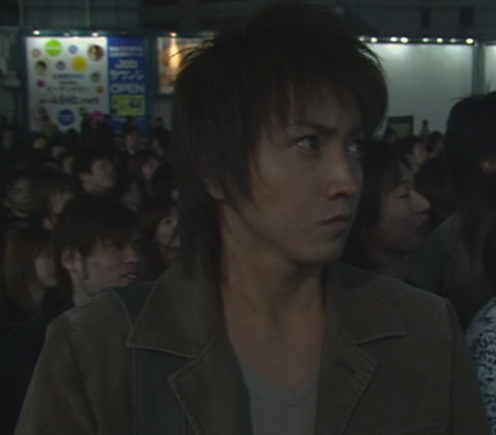 Staring intently at him, Light writes down his name and within minutes the murderer dies right before Light’s eyes. Walking away in shock, and probably delight, Light is stopped dead in his tracks by a voice asking him if he’s having fun. Looking up, Light notices a winged monster. Freaked out, Light is rooted to the spot and can’t run away from the thing that swoops down to face him. Noticing his reaction, the creature asks if Light doubts what he sees and Light, still freaked out, smiles and says that a shinigami (death god) has come to pay him a visit. This makes the shinigami laugh. 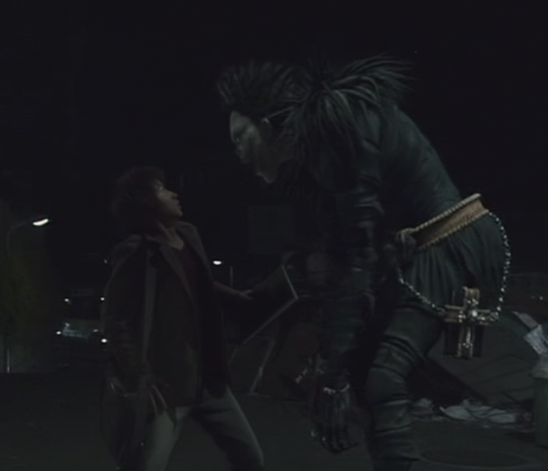 Throughout this whole movie, the shinigami is amused, amazed, and even disappointed in Light. We then fast forward four months where the metropolitan police are talking about the mysterious deaths. Even though they are worldwide with no cause and only one thing in common (a heart attack), the police believe that it is the work of one person – or group. The lead investigator is called down the to chief’s office where he is told that genius detective “L” has agreed to help with this mystery case. 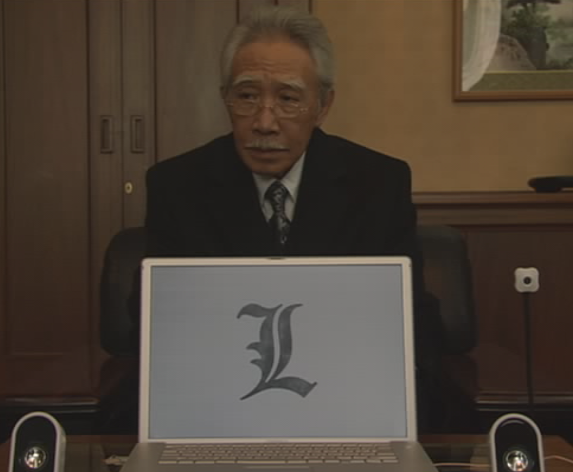 Detective Yagami is introduced to the elderly Watari who is their only means of communicating with the mysterious and reticent L. Watari takes out a laptop and connects to L (who even masks his real voice). L says that he has already narrowed the field considerably. With the data from the murders, he has deduced that there is only one person committing all of these crimes and since the first one happened in Japan, then that is probably where the criminal lives. Gloating over his triumphs in killing all of these criminals, Light is getting pretty cocky. When breaking news comes on his television, a white male introduces himself as “L” and gives his real name. He also states that he will stop the one behind all the mysterious deaths of criminals. Light, amused by this, says he has no time to play and immediately writes L’s “name” into the notebook. The man dies instantly, shocking everyone. The real L then breaks into the broadcast and says that they know Kira lives in Japan, probably even in Tokyo. L also says they know Kira needs a name and a face to kill. This does not please Light at all and from that moment on, the cat and mouse game begins. I won’t recount the rest of the movie in great detail. Basically, it consists of L and Light testing each other. Light determines just how he can use the notebook to get the heat off of him and begins working out methods to get rid of those who want to stop him. L counters and sets up little traps and tests to try to ensnare Light. This back and forth game, along with the myriad of deaths that accompany it, annoys Detective Yagami who says that L’s methods make him no better than the vigilante simply known as Kira. After Light manages to kill all of the FBI who are investigating the mysterious deaths, Detective Yagami refuses to work with L unless he shows himself. L agrees to this and makes arrangements through Watari who leads the police to a hotel where they are formaly introduced to the young detective known only as L. The police are taken aback to see this pale, boy, probably not much older than Light (if he’s even older at all). L reveals who he believes the main suspects are and Detective Yagami is surprised that Light is among them. Thus, surveillance is set up on Light who realizes that he is being watched so he makes sure to do everything he can to throw off all suspicion. When Light is cleared by a clever trick, ex-FBI agent Misora Naomi (whose fiance Light killed) goes after Light and tells L that she will reveal Light’s secret. 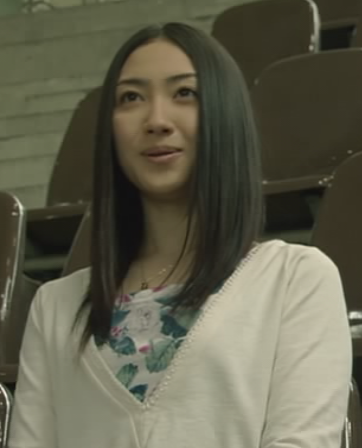 Things don’t go as Misora plans and Light’s girlfriend, Shiori dies before Misora turns the gun on herself. This enables Light to join forces with L to find Kira and thus ends the first movie. My thoughts: I thoroughly enjoyed this. I tried reading the manga and couldn’t get into it and I haven’t watched the anime yet, but I am glad that I decided to rent this movie. It is awesome. Although, I must admit surprise. I didn’t expect the ending and it did disappoint me a little. Throughout this movie, we see the justice-craving Light devolve. 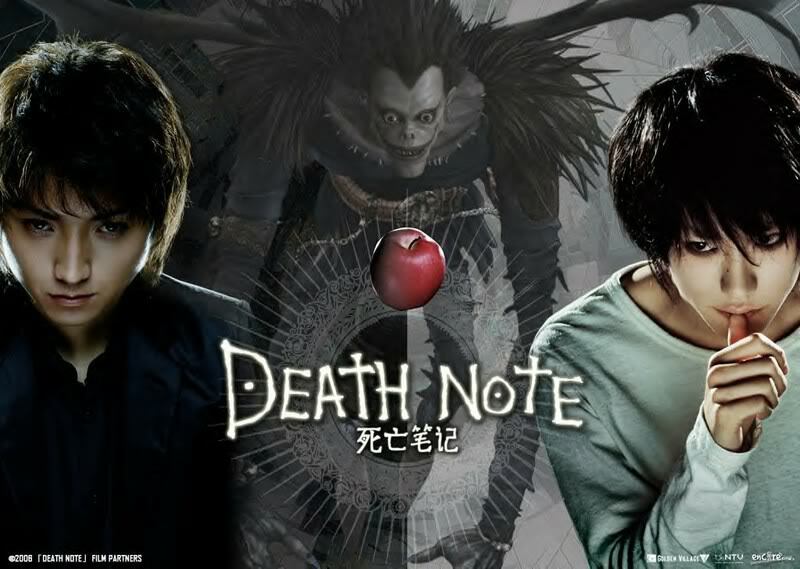 The power he possesses by having the Death Note begins to corrupt him. There is nothing wrong with getting rid of dangerous criminals who will only continue to hurt others, but Light begins to think of himself as a god. He is not a god. But his belief in his godly superiority leads him down a path to which he should never have ventured. Why? Light sees anyone who gets in his way as evil as they are trying to stop him from doing the world a service by getting rid of the criminals. I didn’t really mind when he was getting rid of killers and rapists and the like, but when he turns the powers of the Death Note on the FBI and others, he steps over the thin line between good and evil, which disappoints me greatly. I guess, as the saying goes, absolute power corrupts absolutely. So many times good people start out on a certain path with good intentions only to have power morph them into quite twisted individuals so they are nothing like they once were. Despite my disappointment with the character of Light, I still love this movie. 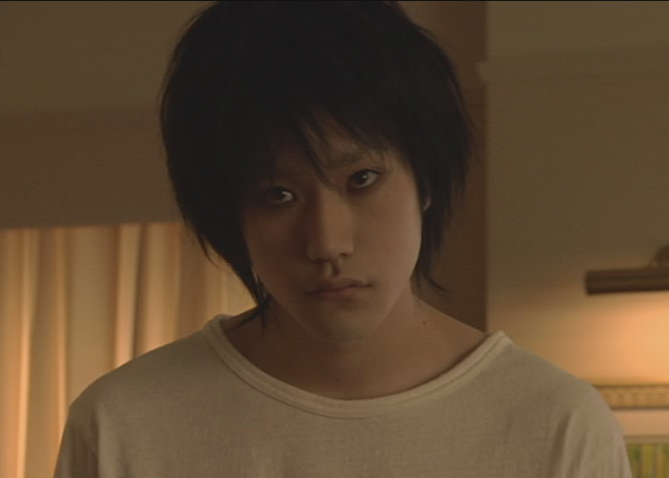 I especially love the reclusive L who admits that he is a lot like Light’s Kira. A person who is immature and hates to lose, L is always seen downing sweets and junk food in doses that should make him fat and ill. Matsuyama Ken’ichi does a wonderful job of playing a very interesting and difficult role. Overall, this is a must see and you don’t need to have read the manga or watched the anime to get what’s going on. I never had time to watch this movie.I will watch this in coming days.